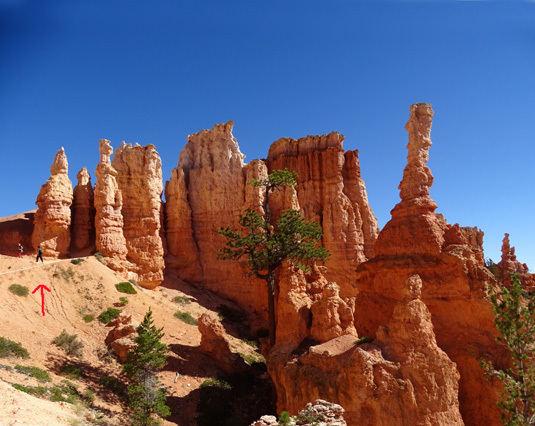 of Bryce Amphitheater. See the Wall of Windows." I think "Peekaboo" is a goofy name for a trail that is indeed spectacular, but that's just my opinion. I keep inadvertently calling it the "Keyhole" Loop. 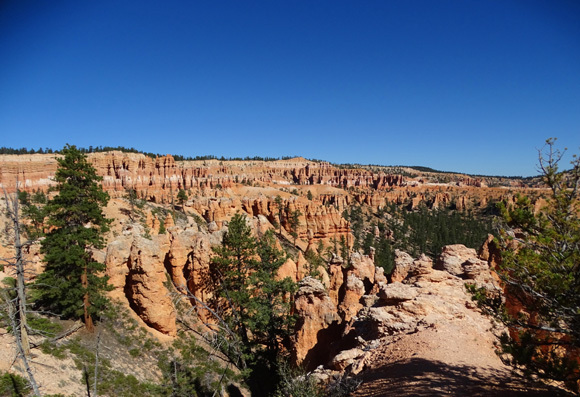 Both monikers refer to the numerous "windows" or holes of varying sizes that have eroded over time in the rock fins (thin walls) and other rock formations along this trail. Some of the holes are huge, like the ones in the Wall of Windows, and some are quite tiny. 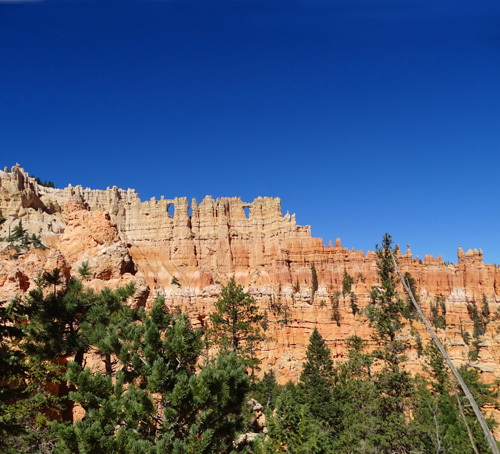 One of the best views of the Wall of Windows is from the Peekaboo-Bryce Pt. trail intersection. It's a fair distance away from this vantage point but you can see the whole wall from here. 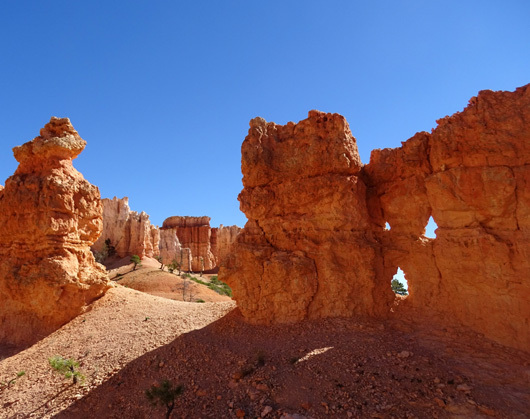 It's a fun game for me to try to find as many windows as I can on each trail here and in Red Canyon. When I hike the same trail in a different direction, I often find windows I didn't see the first time. Windows are more difficult to spot when only trees or other rocks are visible through the holes. Counting windows would be good, friendly competition if you have more one or more kids hiking with you -- or even between two competitive adults. And tough windows to spot should be worth more points than easy ones . . . Spotting windows and other cool features is why I advise visitors to hike these trails slowly and look up and around frequently. Go too fast and you'll miss many of the more obscure details that make this park so special. There are several variations to access this loop by combining it with other trails. The shortest combination is five miles. 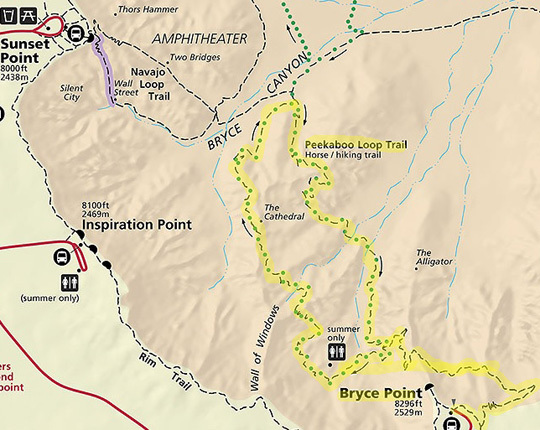 Because of the difficulty of the Peekaboo Loop it is rated "strenuous" in the park newsletter's description of all the trails. 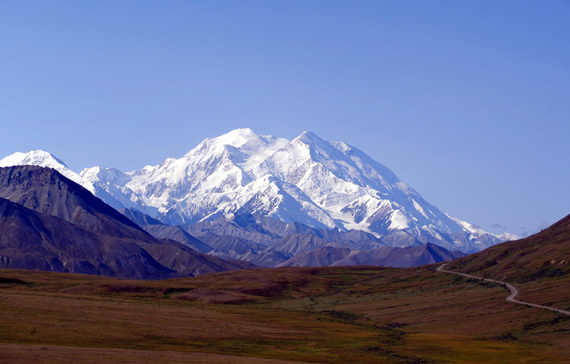 I've hiked it twice, in both directions, and have heard comments from other folks that the trail was harder and took them longer to hike than they expected. I think it's well worth it, though. I love this trail, and so does Jim. I talked him into hiking it with me one time, and we also did a guided horseback trip on the loop. (I'll do a separate entry on the ride.) The scenery is fantastic and not as many people hike this trail so it's not nearly as crowded as the Navajo Loop or Queen's Garden trails. through this tunnel, one of several on the Peekaboo Trail. Here are the two shortest options. 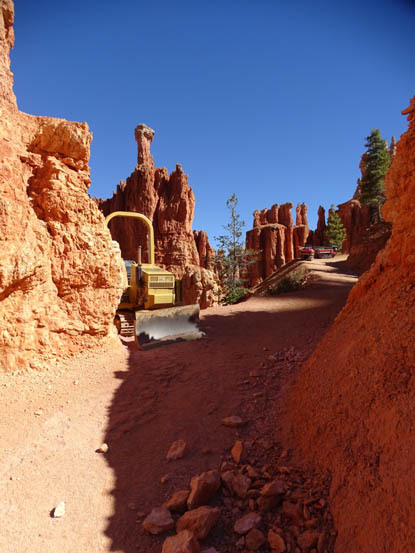 Option #1 to access the Peekaboo Loop is to park at Sunset Point and combine Peekaboo and a rather short spur trail with the Navajo Loop. You can go down either side of Navajo at the beginning of the figure-eight configuration and back up the same or the other side on the return. I haven't done that loop in isolation but I did both those loops as part of a much longer hike one day. 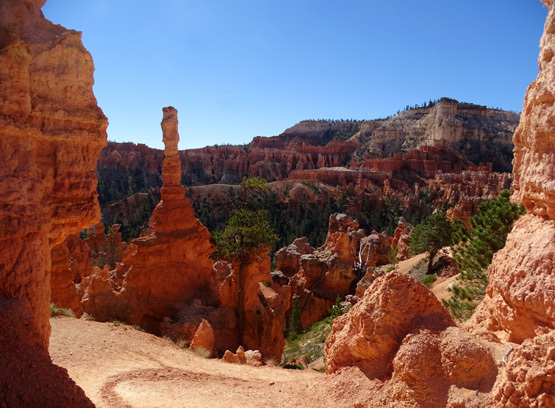 Option #2 combines Peekaboo with the Bryce Point Trail in more of a lolly-pop figure totaling about six miles. This is what Jim and I did when we hiked the loop together. 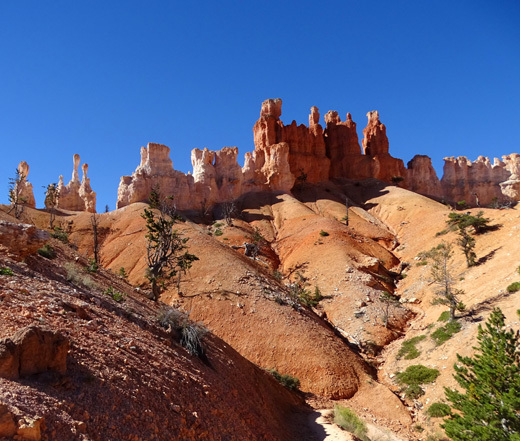 Even though the loop incorporating the Bryce Point Trail is a little longer than the one going up and down the Navajo Loop, the Bryce Point Trail is not as steep as either side of Navajo and doesn't descend as many feet into the amphitheater = longer but a little less total elevation gain and loss. I already mentioned that this trail is rated "strenuous" by the Park Service. 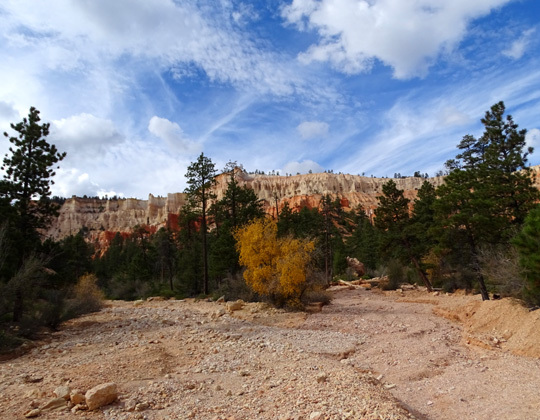 It's very hilly, fairly long for some folks, can have rough and muddy sections after it rains, is at a higher altitude than many people are used to, and runs through hot, dry canyons. 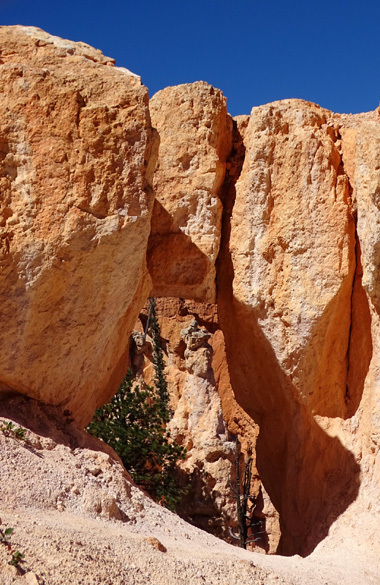 Note that there is a rather steep slot canyon on the Peekaboo Loop with switchbacks similar to the Two Bridges side of the Navajo Loop -- but the slot on Peekaboo is shorter. 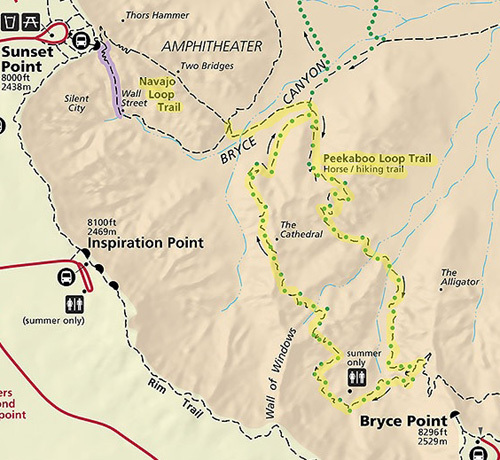 The Peekaboo Loop is more "moderate" difficulty if you're in good physical condition, comfortable hiking five miles or more, used to hilly terrain, and acclimated to heat, arid conditions, and altitudes between 7,500 to 8,000 feet or higher. a short side trail that goes up to a "window" I can look through. 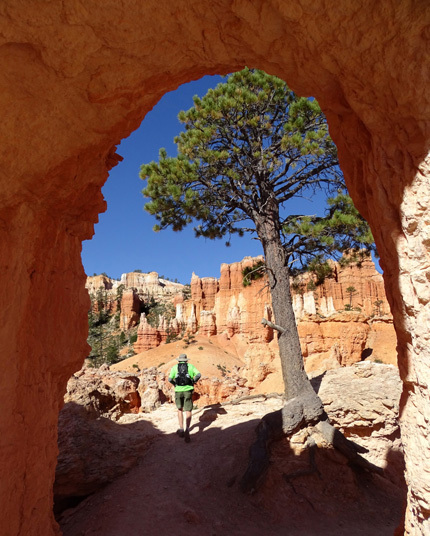 No sections of the Peekaboo Loop are as unrelenting as the upper section of Wall Street on the Navajo Loop. The grades aren't usually as steep but the ascents and descents are numerous and some are rather long, especially going up -- from either direction -- after the intersection with the spur trail. 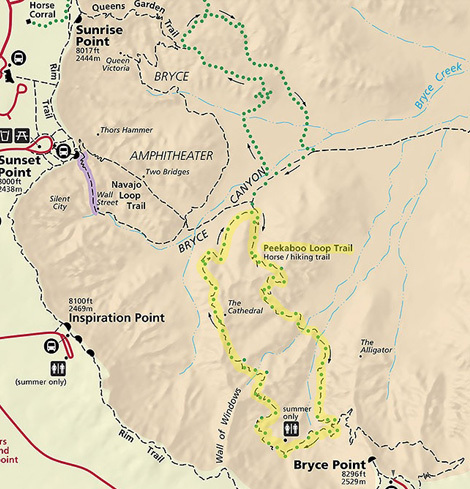 Even if you start and end at Bryce Point you'll still pass that intersection at the low point on the loop. 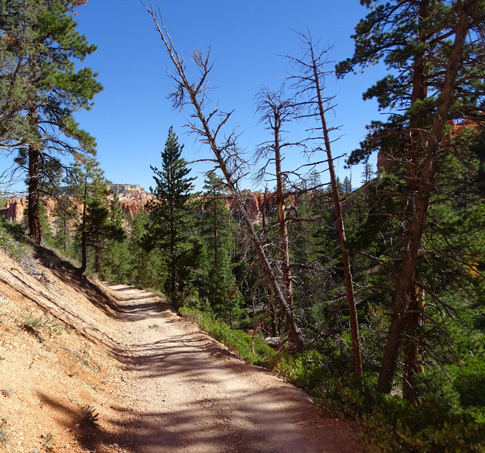 My GPS recorded a total elevation gain and loss of about 3,000 feet over six miles when Jim and I did the Bryce Point-Peekaboo hike (Option #2 above). 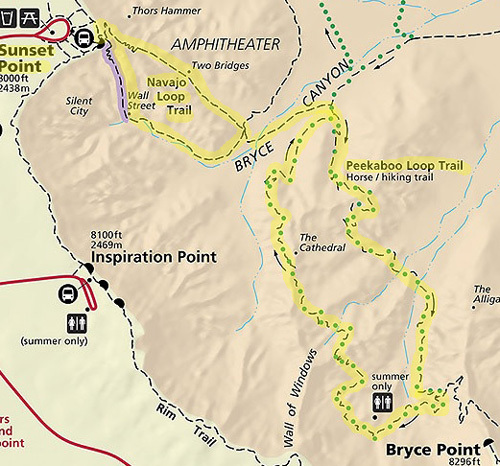 The gain and loss is a little more in five miles with Option #1, the Navajo+Spur Trail+Peekaboo figure-8. 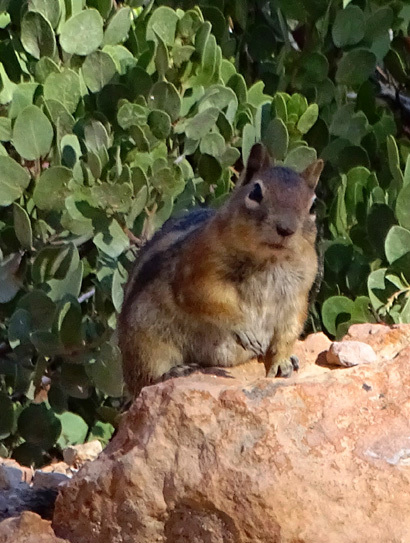 is this one on the Bryce Point Trail in 2016. Some of the trail passes through shady trees. More than half of it is exposed to the sun by mid-morning so a hat, sunscreen, and plenty of fluids are advisable. Some unprepared hikers on the Peekaboo Trail have been assisted by the guides on horseback-riding tours. They carry extra water for the riders and in case of any emergency situations they encounter. They can also radio for help if someone they pass needs to be rescued. 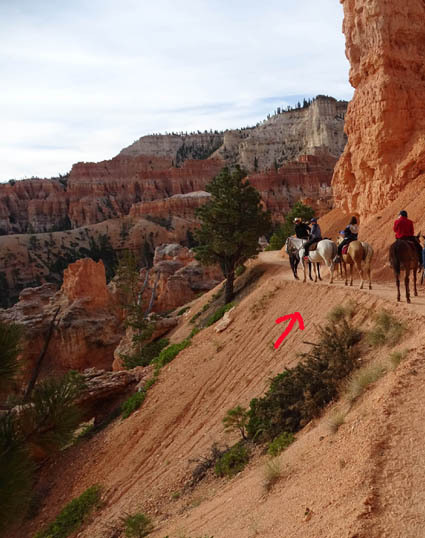 This is the only hiking trail in Bryce Canyon that is shared with horses. The park's horse concessionaire, Canyon Trail Rides, Inc., offers guided horse trips in the spring, summer, and fall, booked either directly or at the park lodge. 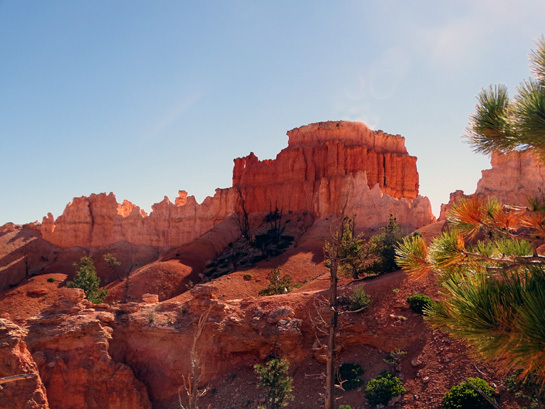 This company has carried close to 20,000 Bryce Canyon National Park visitors down into the main amphitheater on horseback each year recently. 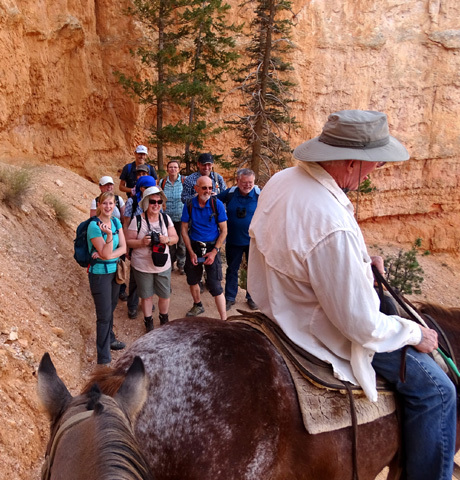 A guided horseback group heads down the Horse Trail near Sunrise Point. Private equestrian groups of up to ten can also schedule trips on the Horse Trail and Peekaboo Loop, with some strict guidelines. They're aren't as many of them and their schedules are more varied so they aren't in the same place when the concessionaire guides are leading their groups. 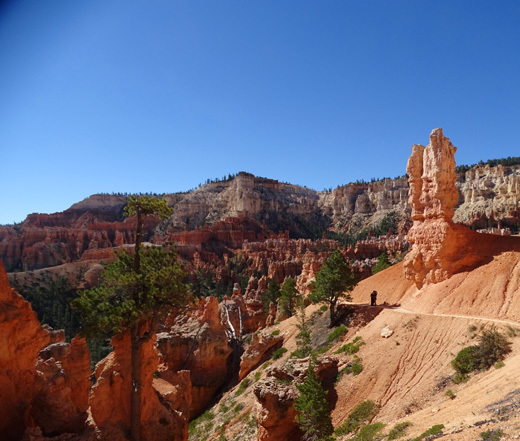 You're much more likely to run into the park's guided groups than the private equestrian groups while hiking the Peekaboo Loop. 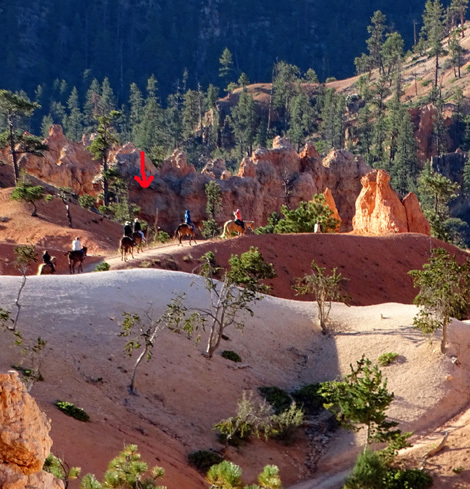 You can see the green dotted line on the trail map that shows how the riders travel from the park stables to the Peekaboo Loop on their own horse-only trail. 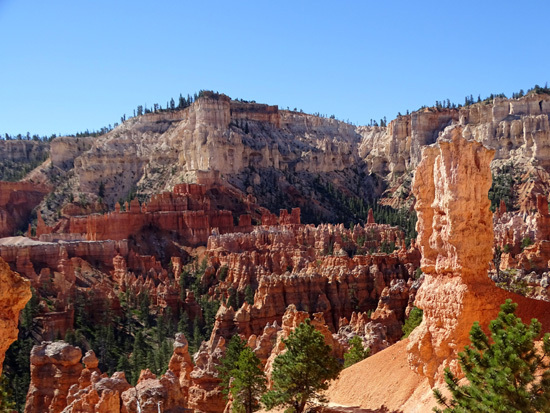 Although I've seen a couple people hiking on the clearly-marked Horse Trail, this practice is discouraged by the Park Service and the horse concessionaire. guided horseback riders on the nearby Horse Trail. Equestrians are required to go clockwise on the Peekaboo Loop, which is also my preferred direction to hike it, mostly because I like the views better in that direction. Regardless of the direction you hike, you'll be walking around some horse poop and urine on this trail. Just for giggles when you're hiking this trail note how close some of the hoof prints are to the edge of cliffs! I didn't notice those until after we took our ride, which was sometimes a little nerve-wracking along those drop-offs because it's been decades since either of us has ridden a horse and our level of trust wasn't particularly high. the white horse is to the edge on this part of the Horse Trail. 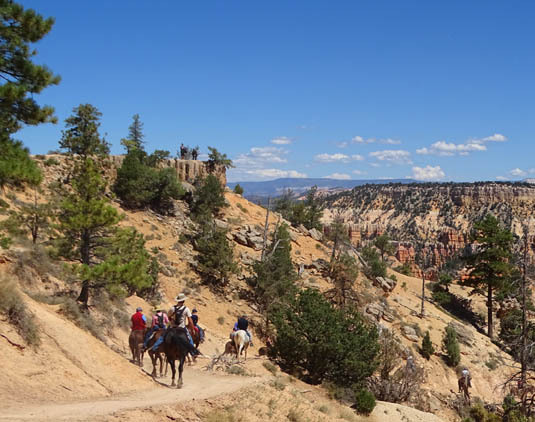 If you want to maximize your chances of seeing horses on the trail go to the booking window at Bryce Lodge where visitors sign up for the rides and find out when the half-day morning trips start and end. This fall they started about 8 AM and ended about noon. Two or three groups of about ten riders each were on the Peekaboo Loop each day during the middle half of that time, approximately 9-11 AM. If you hike CCW you're more likely to meet them somewhere along the loop than if you are going the same direction they are. If, on the other hand, you want to avoid the horses, either get there earlier in the morning before they reach the Peekaboo Loop (i.e., go clockwise and stay ahead of them) or wait until afternoon. The two-hour afternoon trips don't have enough time to do the Peekaboo Loop. 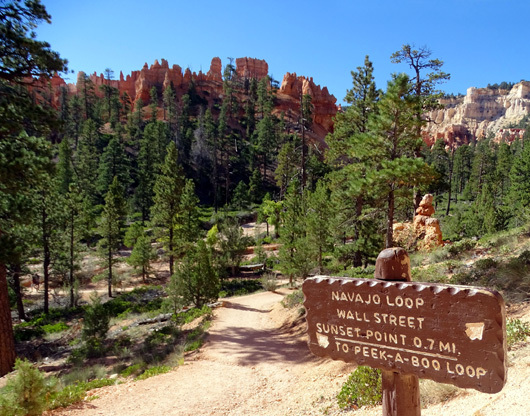 I mentioned that the only two access trails to this loop are from either Bryce Point or the spur trail at the bottom of the Navajo Loop. 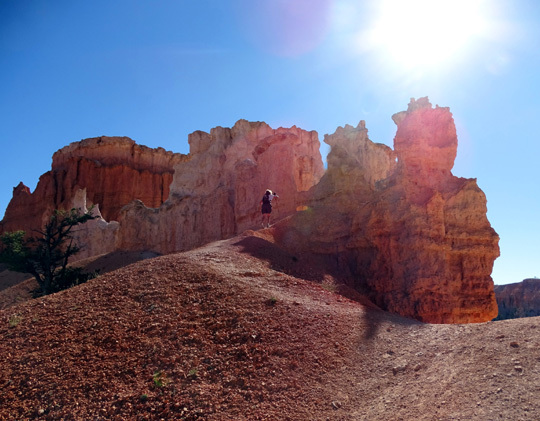 Many visitors to Bryce Canyon aren't able to hike this trail because their time or ability is limited. I'm including over 80 photos in this three-page entry so more folks can see what it's like. I took a lot more pictures than that during our visit this fall -- and even more on our two visits here in 2016. OK, let's get going! I'll show you why we like this trail so doggone much. View from large wash toward the rim; note the pretty yellow aspen leaves. Hikers turn right at the intersection with the horse trail and can go up either side of the Peekaboo Loop. Despite the arrows around the loop on the map it is one-way only for the horses, not hikers. Both ascents are fairly long but they are gradual. These photos show views going clockwise, the same direction the horse tours go. They are from two different hikes and look both forward and backward. The Bryce Point overlook is in the background of this and the next two photos. have them in a shot, as above the arrow, to give more perspective to the landscape. 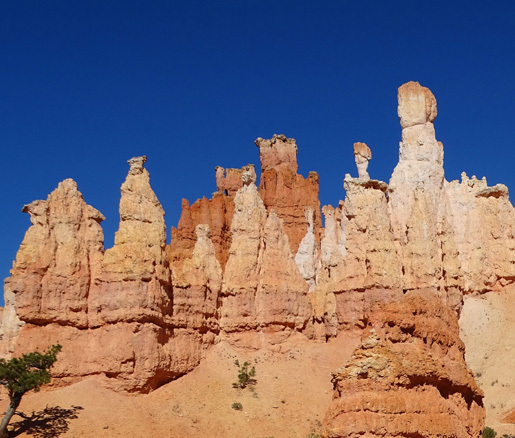 Bryce is renowned for its whimsical rock spires and pretty sherbet colors. in the background; it will sport tiny pink bell-shaped flowers in the spring.